LOCATION: Bright, 1 Westgate Street, E8 3RL [map]. BREAD: White sliced. No messin’. FILLING: Breaded, deep-fried pork, shredded white cabbage, katsu sauce. PROS: HA. Didn’t expect this, did you? I’ve written another review! Remember when I told you the katsu sando is a trend? Yuh huh. FEEL MY TRUTHS. It’s amazing how two sandwiches made with the same constituent parts can be so different, though. 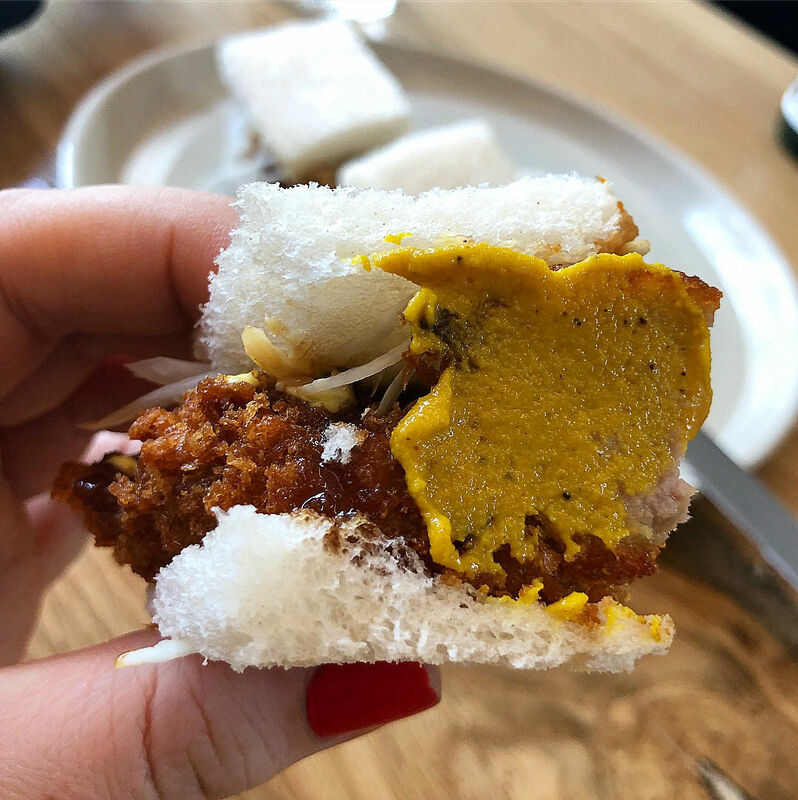 Now I think, I think – and I say this as a person who has never even been to Japan – I think, this is more what a tradish katsu sando is like. The crusts are off, for a start, and it’s very neat, you know? It’s very beautiful and the cutlet has the perfect crunch and each bite I feel like I’m floating above my chair watching myself have a moment and I want to prise the fingers of my dining companion apart and take his piece of the sandwich and eat it for myself, like a sandwich Gollum. My precioussssss. Oh, but what is not tradish at all is the hot mustard – a stroke of genius. Yes to fierce yellow condiments, which only work because the katsu sauce, in this case, is quite timid. CONS: It’s more expensive than the sando at Nanban AND it’s smaller but that makes sense in the context of it being a touch self-conscious. Bright is one of those places that’s like ‘oh we’re totally casual, we’re like the new wave of chilled out wine people don’t be afraid’ but then you ask a question about what to drink that doesn’t quite scan past their wine-dar correctly and they laugh at you for not knowing they would absolutely NEVER stock such and such style of x. That annoyed me, I’ll be honest. Point off for that, lads!